When it comes to time management there is nothing more dangerous than an empty calendar. Calendars give us a visual idea of what time we have or do not have to offer. At work, when someone says, “Julia! Wanna join us for lunch at 12?” “Hey Justin, would you take over the events planning committee?” “Do you have a sec? Actually, I need your assistance going over these documents with me.” Without referring to your calendar, you can make yourself vulnerable to not giving a fair consideration to what time or effort you can make for others and still stay on your game. For more on our instructor-led time management workshops call us on 888.815.0604. Here are three tips to ensure you are making the most of your calendars. The CAC study showed that most calendars are placed in the kitchen and second to that would be the home office area. What is most important is that you see it wherever you spend the most time. 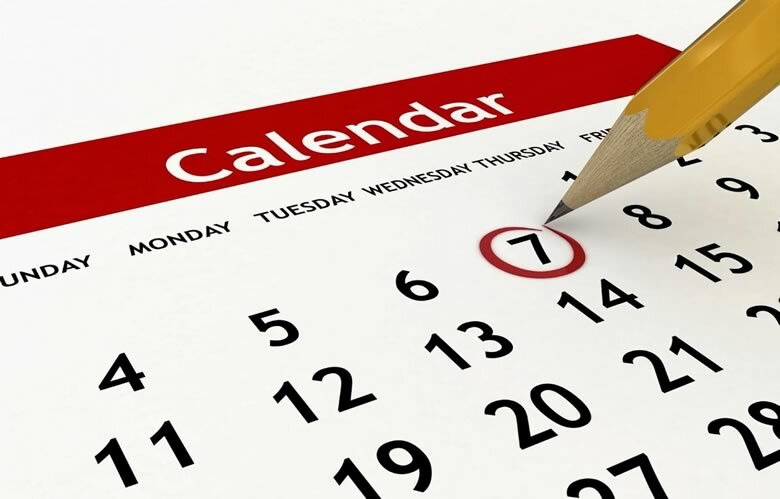 Having a printed calendar posted allows you to anticipate upcoming events such as trips, major deadlines and any holidays that may affect your priorities. Think of your calendar as a windshield keeping you in the direction of your long-term goals. Do this at least once weekly and tally up how much time you actually spent in those designated areas. Maybe you take less time getting ready with the TV off or you learn you are not getting enough sleep. Weekly review makes a huge difference in setting new habits. Designating time for calendar management is crucial to success and keeps you on track with your goals. Start with your large printed calendar, next, add designated times for your values on your portable calendar and third, block out calendar review time to tally how many hours you are putting toward the activities you do. You may surprise yourself and it will help you to become more conscious, focused and able to see where you need help, more discipline or how you can “make time” for people and projects that fuel your creativity for handling all that you do. Next time someone asks for your time, look at a wider view of your calendar and always offer two options that would work for you. As you become more mindful of what you are trading off as well as how you can adjust to become more efficient, you will encourage respect from others to also respect your time. Leaving a calendar empty or changing plans without rescheduling what you do at specific times of the day can render you less effective in your own life. You need sleep! You need head starts on your workload before trips and you need to have a good idea of what trade-offs you are making for your work so you can make those up another way. Sign up for our Time Management class today for coaching on goal setting, time management implementation and learn other useful tips to keep you on track with getting things done at work and in life. Through our network of local trainers we deliver onsite Time Management workshops right across the country. Obtain a quote for an Time Management class.